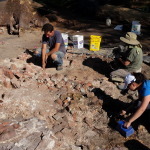 Since 2011, the Fairfield Foundation has teamed up with Adventures in Preservation (AiP) to provide workshops on preservation, restoration, and archaeology to interested parties. 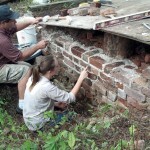 After two successful workshops focused on restoration projects at the CAPE, we began to hold workshops focusing on the interplay between historic preservation and archaeology at the Fairfield plantation site, specifically aimed at techniques to stabilize the remaining foundations of the manor house. Volunteers like you are helping uncover fascinating glimpses into a world seldom recorded in historical documents. Excavations are revealing the long-lost layout and design of the manor house while creating the challenge of preserving what remains of this historic structure for the future. Each bit of work done furthers research into the site’s complex history, helping future visitors better understand the plantation era. Workshop participants get valuable hands-on experience as they learn from experts in both archaeology and historic preservation. In the summer of 2019, Fairfield and AiP will be hosting TWO week-long workshops at the Fairfield plantation site. These workshops will run from June 10-14 and August 12-16. For more information, or to reserve a spot in a 2019 workshop, visit the AiP workshop website. You can also read some of our blogs (and participant blogs!) about the workshop experiences from 2012, 2013, 2014, 2017, and 2018.